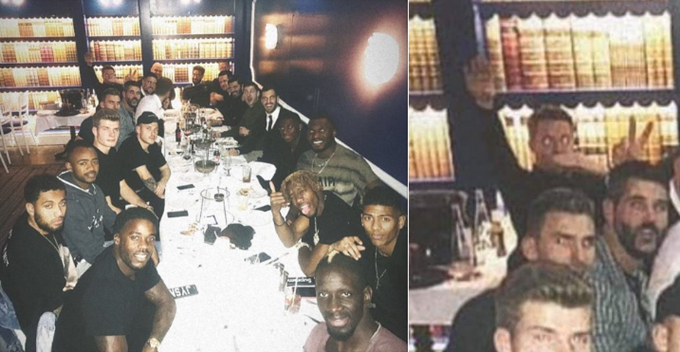 For the briefest moment, it looked like Wayne Hennessey might have made a ‘Hitler salute’ during a Crystal Palace team dinner on Sunday evening, but, following clarification from the man himself, we can thankfully confirm that that wasn’t the case at all – far from it. Having successfully seen off Grimsby in the FA Cup the previous day, the Palace squad ventured into London for a celebratory outing the following day. Yesterday evening I had a meal with my team mates and we had a group photograph. I waved and shouted at the person taking the picture to get on with it and at the same time put my hand over my mouth to make the sound carry. It’s been brought to my attention that frozen in a moment by the camera this looks like I am making a completely inappropriate type of salute. I can assure everyone I would never ever do that and any resemblance to that kind of gesture is absolutely coincidental. This is bringing back sour memories of Mark Bosnich’s similarly crass salute made to Tottenham fans in 1996 after being goaded with chants of “Klinsmann, Klinsmann” after the two players had clashed in a previous match. The Aston Villa ‘keeper was duly cleared by the FA after claiming his gesture was not one of Nazi reference but instead an homage to Basil Fawlty. To this day, we’re not entirely sure we believe him.